Not that long ago, back in 2007, The Royal Bank of Scotland was the largest bank in the world, and it was continuing to grow, going from success to outrageous success every year. But it soon overreached and gambled once too often. The fall from the top to the bottom happened in no time whatsoever. The following 10 years have been humbling for the Bank and many of those associated with it. Ross McEwan, the current Chief Executive Officer (CEO), has been driving a carefully managed and pragmatic turnaround. A few years ago, the Senior Leadership Group was being reduced from 200 to 100 top executives with many newly appointed to the group. Those selected were invited to a meeting in London at IBM’s offices on the South Bank. They didn’t know why they were invited, there would be no announcements and all they knew was that they had to be there at 08.30am. There were no badges and there was no signage. I was already in the auditorium with Ross and his Head of Communications. We had prepared and constructed a challenging day that would communicate the new vision for the bank and open up discussion with the group. As we headed towards 09.00am, Ross moved towards the door of the auditorium, and stood there waiting. As the first of the attendees filed in, Ross shook each by their hand and called them by their first name and had a unique message personalised for every attendee. “David, welcome, you have been doing a great job with the new retail products in Europe.” He warmly shook the hands of all 100 attendees and he remembered everyone of their first names. It took him nearly 45 minutes, but what an investment in each of them and the team. He had electrified the atmosphere and as they all sat down, they were excited and more than ready to go the extra mile for Ross. 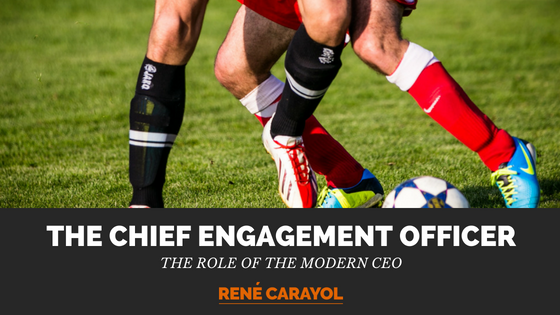 He was definitely the CEO, the Chief Engagement Officer. The new age multifaceted demands of the CEO have made the ‘office’ the most unlikely place to run a business from today. The days of the aloof but brilliant CEO, spending most of their time in long Board and Executive Committee meetings are becoming fast history. Unrelenting advances in new technology, the widening generational shifts and rapidly changing demographics have changed the demands of the role of the CEO. Being clever is a pre-requisite but nowhere near enough on its own. There is a clear and growing need for a more dynamic approach, meaning that the modern CEO must be more visible, accessible and much more engaging than ever before. It should not be mistaken for having to be a charismatic extrovert, its much more about being openly authentic whilst remaining true to their values and beliefs. These have to be shared and displayed for all their stakeholders both internally and externally. There are many alternative ways to achieve this, and all are opportunities to engage physically, virtually and of course, socially. This should not be at the expense of the ongoing engagement with the Board and shareholders. It may not be feasible or desirable to try to cram everything required into one individual anymore. The traditional and vital requirements and skills; financial, strategic, tactical, relationship with the Chair, understanding of shareholder expectations still require delivering but will force CEOs to empower their best people even more now. They cannot do this all on their own anymore (in fact they never could do it all alone). The recent high-profile departure of Martin Sorrell, after 33 years as CEO of the business he effectively founded and ran so strongly, WPP, saw the Board having to take the tough call that they required a far more engaging and consultative presence at the helm. The same could be said of Arsene Wenger, who was pushed out after 22 years as the coach of Arsenal Football Club. 2018 is beginning to look like a tough year for some longer serving leaders who may have had it all their own way in their heyday, but the world of business is moving very fast indeed these days. But it’s rarely about the number of years served, but much more about their ability to adapt in rapidly changing times. Wenger and Sorrell were great innovators and wrested total control by their continued success. By eventually infusing their organisations with their personalities, they would become the living embodiment of their respective businesses. Nobody argued with this when things were going well, but not everything stays the same for long anymore. Instructively, both had the chance to leave whilst at or near their peak, but neither had become adept at engagement, they were both great communicators but that is not sufficient anymore. It was far too often about getting their thoughts and motivations across clearly and unambiguously. There just was not enough engagement with those who had alternative views on the way forward, or those that wanted to help and assist, but this was not the way that had been successful. They both had grown up in a world where the culture they created was all about ‘challenging down and supporting up’. Today, it’s the precise opposite that is needed to be successfully engaging with all the organisation, ‘challenging up and supporting down’. Unfortunately, this was never going to be the way these two longstanding giants of their businesses would voluntarily vote for. Having decided against accepting the new ways, both now depart with reputations that are impressive, but looking somewhat dated and out of touch. What ultimately brought about the end for Wenger was the rise of a new generation of far more engaging coaches with fully empowered backroom teams who could make and take big decisions, they weren’t just ‘water carriers’. WPP struggled to answer the challenge of online advertising and the new digital world. Many of the leaders of the subsidiary WPP businesses were wanting to challenge the strategy and direction, but that was never going to be easy or even possible with such a powerful and headstrong leader like Sorrell in charge. In both cases, something had to give. There are older leaders that can adapt and update their approaches and methods, Sir Alex Ferguson, the former Manchester United manager and Wenger’s long time old rival, was still changing in his seventies. But it requires having a top team that is designed to challenge and support the leader in equal measure. It also requires the humility to really accept that you cannot do everything on your own anymore. Sir Alex became ‘the face and the voice’ and appeared to be everywhere. He reduced his time and influence on the training pitches but remained as successful whilst being seen to be so much more accessible and amenable to the new demands for endless engagement via many new platforms. Far too many CEO appointments are still missing the ability to authentically engage with stakeholders critical to the success of the company. This need for ‘always on’ engagement is fundamentally redefining the role and forcing the demand for different attributes and capabilities from the potential contenders for this prized role. When questions are asked of you, it is critical to respond in real-time, whether it be in person, on a video conference or through social media. Share all the information you possible can, and do it often, listening to all the feedback. Non-critical matters are the ones that are talked about most – give junior members their voice on everything. René has also provided leadership support to the UK Prime Minister's Strategy Unit, The United Nations and The World Bank. He is a visiting professor at Cass Business School and in 2004 was awarded an MBE for outstanding service to the business community. He presented the BBC series Did They Pay Off Their Mortgage in Two Years? and is the author of Corporate Voodoo and more recently, Spike.